In the Sinai city of St. Catherine, a few thousand people and around 800 camels have been left struggling since the first week of August, when Egyptian security authorities ordered the total shutdown of the town’s 1,500-year-old monastery. Bedouin residents of the mountainous area were forced to sell their camels, which they cannot feed, to feed their families. Over the past 50 years, St. Catherine’s Monastery closed its gates twice, in 1977 when former President Anwar Sadat made his historic visit to Jerusalem, and in 1982 when the Egyptian military entered Sinai after the withdrawal of Israeli forces. 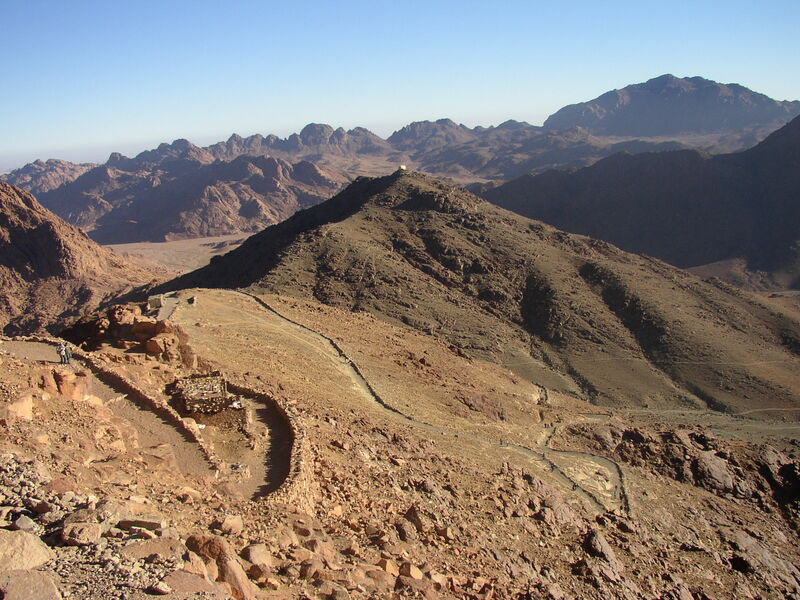 This time, the shutdown, which wasn’t explained by any official statements from either the Defense or Interior Ministry, was allegedly ordered after a failed attempt to kidnap a monk traveling in South Sinai in June and rising suspicions of a possible attack on the monastery. “Despite having more time to pray and practice, our priests live without crowds of visitors, we are suffering a major financial crisis, and we cannot cover the monastery’s expenses and dozens of families that we constantly support,” said Paolos, who wore his farming clothes covered in mud. St. Catherine’s Monastery employs 400 workers from the surrounding community at its olive groves, grape farms, honey bee farms and several processing facilities including an olive oil press. As of the beginning of September, the monastery reserves decreased to a level that is barely enough to cover two months of expenditure. Monasteries making income? Located at the foot of what is purported to be the Biblical Mt. 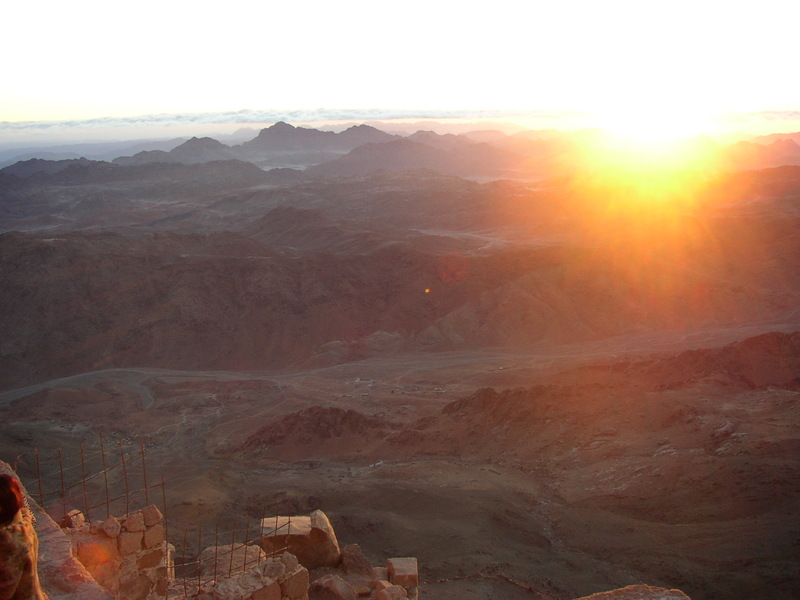 Sinai, streams of tourists come, climbing the mountain at night for a spectacular view of the desert at sunrise. 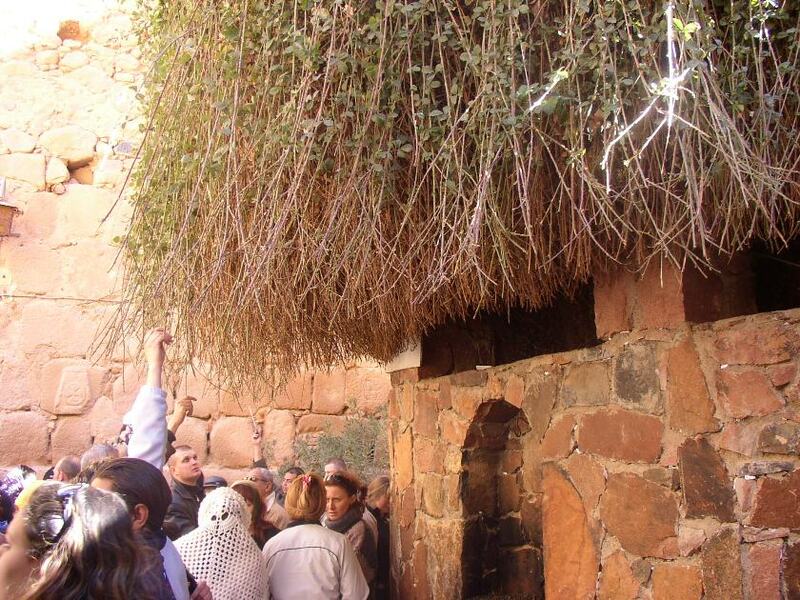 The pious/superstitious/relic-ly-inclined religious tourists also pick leaves from the burning bush – now a towering hedge that drops its branches down just high enough to be reached by tippy-toe. 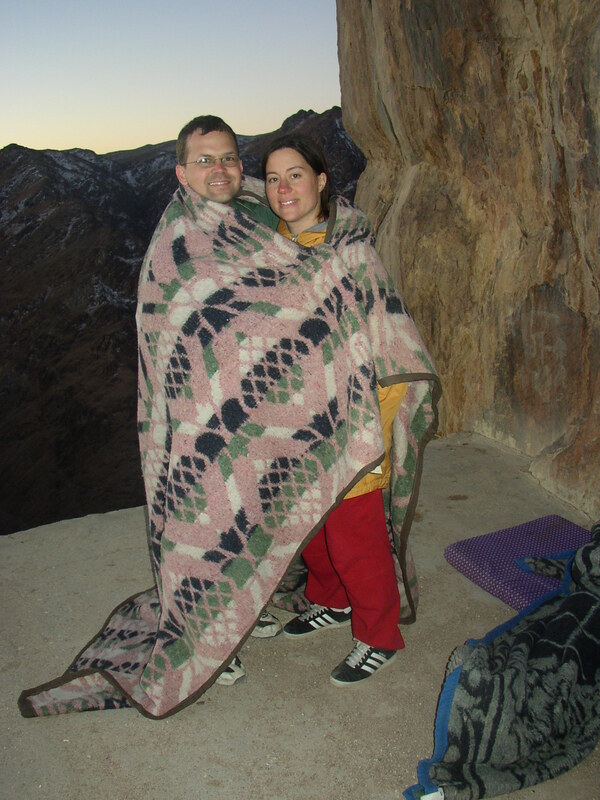 We visited once, several years ago when we could climb without children. We were impressed, even though disappointed that our tour bus whisked us away right afterwards, without much chance to explore the ‘real’ monastery. And of course, being a tourist trap, there was a steady flow of income to match the steady flow of tourists. … but this was our reward. Since we moved to Egypt, we have learned a great deal more about monasteries. They are wonderfully spiritual places where monks abstain from the world and devote themselves to prayer. But they are also the favorite destination for Copts who frequent them as a weekend get-a-way. The monks’ residences are kept separate from publicly accessible areas, and a handful of monks are assigned the role of facilitation. Some visitors seek spiritual counseling, some seek the blessing of praying in a historic location, and others simply enjoy the time away from the bustle of Cairo. 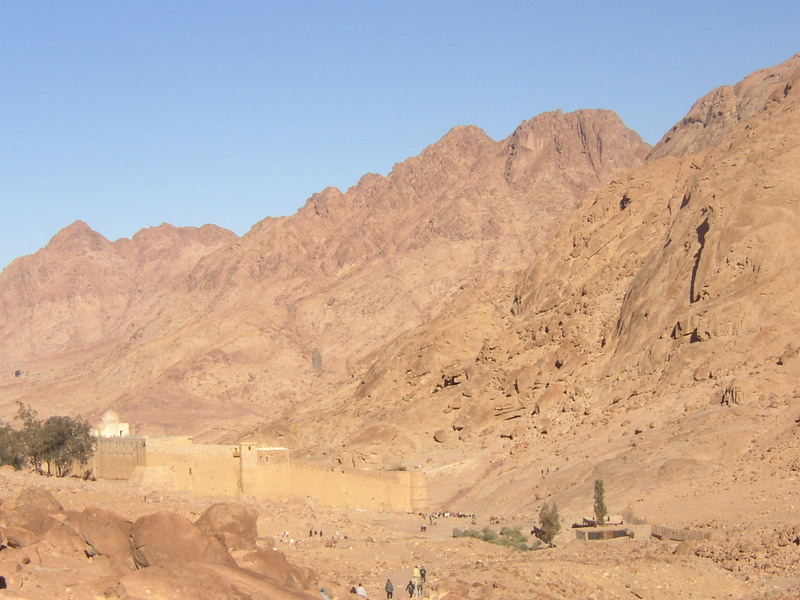 St. Catherine’s monastery is located deep in the Sinai desert, so it is not a favored location for most Copts. But it is only an hour or two drive from the popular Red Sea resorts drawing thousands of tourists every year. Even so, it has evolved in a similar function to many of the monasteries a mile or so into the deserts surrounding the Nile Valley. They are a hub of economic activity. The monasteries have turned desert into farmland and cultivate agriculture and livestock. They cooperate with local villagers – usually Muslims – and employ some. They also attract unemployed Copts from throughout the country to live on or near the premises – but not with the monks – and provide labor while receiving training. Many monks will spend half the day in prayer, and the other half supervising a commercial task. Monks have no worldly possessions, so I am not sure where the money goes. Certainly some is for the upkeep of the monastery, most of which have undergone substantial renovations. Other is for the pay of the labor, which in brief conversations I found to be better than the going rate in the village of origin. I imagine their charitable expenditures are also extensive. But I have not yet discovered the whole story. Some more extreme Muslims accuse Copts of storing weapons in their monasteries and operating a state within a state. The first claim is baseless by all appearances, but the second has some merit. The monasteries own huge tracts of land and many Copts flock to them not only for blessing but also to purchase internally produced goods. These are also shipped to churches in the cities and sold on their premises. Muslims are welcome in the monasteries and they generally have good relations with their neighbors. But the vast majority of visitors, dare we say customers, are Copts. Their money circulates within their community. By no means do I wish to overstate the idea of a state within a state or impinge the spiritual reputation of Egyptian monasticism. In my experience most Copts are part of their local communities, interacting with Muslims in employment and commerce, part and parcel of the national fabric. In my experience most Copts visit their monasteries out of a deep respect for their spiritual heritage and in order to take blessing from association with these historic sites and the saints associated with them. In my experience most monks are somewhat annoyed by their inundation with visitors, and wish to spend time with God in both prayer and labor. But the ‘worldly’ aspects of monastic life exist. At St. Catherine’s, the accrued dependence upon them is threatening the monastic community. The monks, likely, will be able to retreat into their asceticism as in centuries before. The monastic enterprise, however, along with all its local relations, is subject to the whims of economic cycles and security concerns. Perhaps Egypt’s current troubles are reminding Copts of their necessary dependence on God. Even for monks, this is an ongoing lesson easily forgotten.